The song cycle, Dylan, is a chronological account of the life of the Welsh poet Dylan Thomas. Each song is preceded by a short spoken text, and these, together with the words used for the songs, date as closely as possible to the period and subject matter in question. Many of the striking elements of Dylan’s life are included: the controversy of his character, poverty, alcoholism, the tempestuous relationship with his wife Caitlin, America, and of course his remarkable ability to write and speak so astutely and evocatively. Dylan is recorded on the CD "Dylan" by Roderick Williams and Sioned Williams. 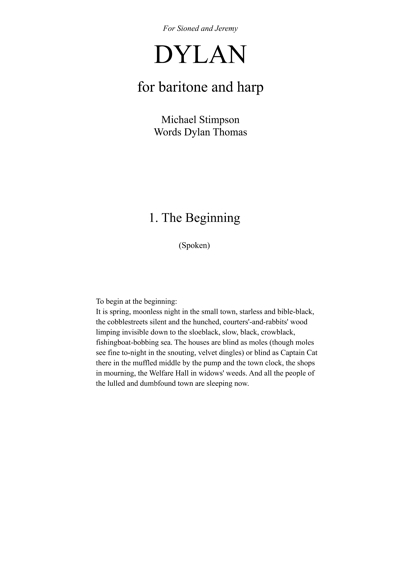 The ‘Dylan’ song cycle was instigated on the stage of the Purcell Room when Sioned Williams, principal harp with the BBC Symphony Orchestra ,was rehearsing a different piece of Michael’s. He said later "I remember making a throwaway remark about doing a piece about Dylan Thomas and it seemed so appropriate, with Sioned’s Welsh background and a series of little coincidences of my own - I had, for example, lived as a student in Delancey Street, opposite a house that Dylan had lived in. And so I began to think through the work and the result was a biographical song cycle based on Dylan’s poems and texts". The cycle traces his life from childhood in Wales, through tempestuous marriage to Caitlin and his long battle with alcoholism, to his untimely death in New York in 1953. The work was premiered at the Brangwyn Hall in Swansea and the Wigmore Hall in London. 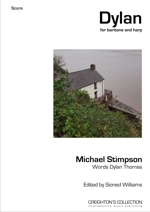 The recording of this work was taken from the performance of the work at the Llandudno Festival…Michael Stimpson’s composition is a fine understanding of Dylan Thomas, the poet and the man, and this performance made it abundantly clear just how good it is (review, Llandudno Festival). 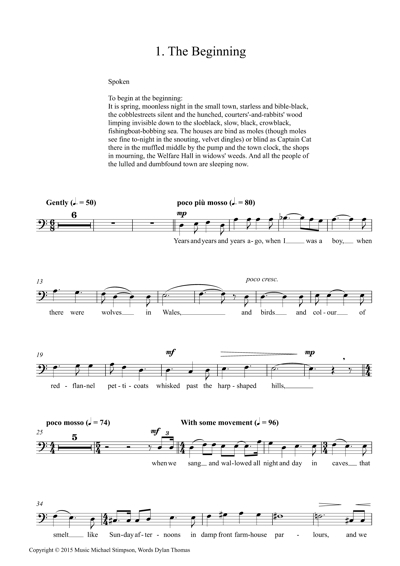 When drafting the song cycle it seemed appropriate that it should begin and end with spoken text from Dylan Thomas's most famous work, Under Milk Wood. Dylan Thomas was born in Swansea on October 27th 1914; hence the briefest of musical references to World War I is made midway during the accompanying song. The words for the song are from one of Dylan Thomas's many short stories, A Child’s Christmas in Wales, one of his most evocative works that look back on childhood. In September 1925 Dylan Thomas entered Swansea Grammar School and two years later his first published poem appeared in the Western Mail. His character at this time is reflected in another short story, Return Journey, and this provides the spoken text. The song is a setting of I dreamed my genesis, published in 18 Poems (1934). Thomas wrote of this poem (and two others), 'I do hope you'll like one of them, though I admit their constant anatomical symbols can't be to the taste of many, and are, quite often, not even to the taste of myself’. In the summer of 1931 Dylan Thomas left school to be a reporter on the local newspaper. In a letter of January 1933 on why he allowed himself to be fired from the newspaper, Thomas wrote 'No, what I feared was the slow but sure stamping out of individuality, the gradual contentment with life as it was, so much per week, so much for this, for that'. Within two years one of his significant poems had been published, And death shall have no dominion. 1933 was also the year of his first visit to London and I have therefore used his poem I have longed to move away, first drafted in that year. This was published in a later collection, Twenty-Five Poems, by which time he was a young celebrity in London. The spoken text is from Return Journey. Dylan Thomas married Caitlin Macnamara at Penzance registry office on July 11th 1937. Their early plans are described in the spoken text, a letter written shortly after the wedding. Not surprisingly, this extraordinary and tempestuous relationship is a focal point of Thomas’s life. In some respects, Caitlin’s character appears (to those like myself who read about her rather than knew her) as varied and complex as Dylan’s himself. The song is a setting of I make this in a warring absence, published in Twentieth Century Verse in 1938, with the title ‘Poem (For Caitlin)’. Dylan Thomas’s capacity to drink is one of his most famous, or infamous, characteristics. While the quantities may be questionable, the regularity and influence on his life is not in doubt. Stories abound, but I have retained in my mind his drunken sleep, his hangovers, his ability to fall down the steps to his house in Laugharne, and his more boisterous self, in this loosely based variation for harp on Bread of Heaven. The preceding text is from Under Milk Wood; the spoken interjections are from various letters. 1939 saw the birth of their son, Llewelyn, and publication of another important collection, The Map of Love. As the extract of a letter illustrates (spoken), Dylan Thomas was not keen to take an ‘active' part in the war and for much of the time he was a scriptwriter for the Strand Film Company in London. For the song I have chosen Ceremony After a Fire Raid, probably written just prior to publication in 1944 during the months when the family moved to Sussex to avoid the heavy bombing in London. By this time, Caitlin and Dylan had a daughter, Aeronwy. Dylan Thomas’s attitude and problems with money are at times hard to comprehend. He had a remarkable ability to spend, withstand poverty and hide his wealth, seemingly from those close to him as well as from the casual acquaintance and the tax authorities. Although the letter quoted in the spoken text reflects some of this, it is a considerable contrast to the words of the song. This is a setting of Prologue, a preface in verse for Collected Poems and published in 1952. By this time the family had moved to the Boat House in Laugharne. Under Milk Wood was first performed in May of 1953 (spoken text). Although Dylan Thomas was enjoying considerable success, particularly in America, the toll of his lifestyle was beginning to tell. His relationship with Caitlin was under increasing strain and his health deteriorating. In October Thomas returned to the USA for his fourth trip. On November 5th he collapsed in New York City and died on the 9th November 1953 in St. Vincent’s Hospital. 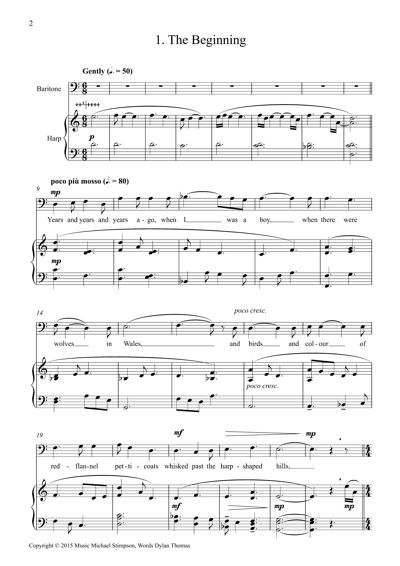 Text from his story, The Visitor, provides the words for the final song. © Dylan Thomas, reproduced by kind permission.